My name is Anthony Barnard [often referred to as 'barney']. lm a 46yo happily divorced bloke living in good ol' Bris. l have a wonderful 12yo son who has no interest in motorcycles at all...but hey...there’s still time. About 2or 3yrs ago l went to have a look at a classic race meeting at Morgan Park. Dont recall how l knew it was on...heard it in passing at a bike shop l think. lt was great to see those blokes going hell for leather on their bikes and having a great time. Nice bunch of blokes too it seemed. Well l got to talking to a couple of them...Bert Skuce [l still have that photo somewhere Bert..] , a young guy racing a B31 350 BSA? , and Brian Fleming and his lovely JAP , and the seed was sown. While l was rebuilding a couple of road bikes back then [and still am..] , l kept an ear to the ground in case a bike come up for sale. That wasn’t happening so l started thinking about building a bike and spent a year looking on ebay and websites for parts , bits and advice. As recently as April this year l bid on two Norton frames overseas..
One afternoon in May [?] 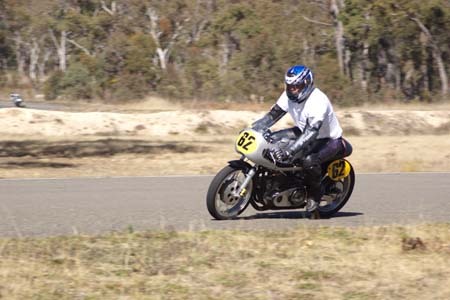 , l was talking to one of the committee members on the phone [apologies l cant recall who..] , and he mentioned that 'Fraser MacMillan might have a bike for sale...l think its an ES2 Norton.."
That will do me l thought...and promptly called Fraser for a chat. The ES2 wasn’t for sale...but a very nice ESO/Norton 'might' be for sale. A month later l am [almost] the proud owner of a 500 ESO/Norton. The last two weeks were fairly frantic trying to get the bike 'ready' for Stanthorpe. lt would have been nice to have a track day sometime before... to get used to the bike...but time and work and life get in the way at times. We took the bike to the local dyno and she ran well and strong and we squeezed a horse or two extra out of it. Fraser was a great help in prepping the bike and showing me its intricacies and foibles and quirks. l didn’t know what to think about Stanthorpe but l had almost no sleep Friday night. Fraser picked me up on the way and it was an easy trip. We got to the track about 9 and rapidly unpacked the trailer and got the bike ready to race. l had not ridden the ESO a metre before Stanthorpe so l took it very easy during practice. New to racing...l tried to be mindful of the rules and the other riders. During the riders brief Brian Flemming suggested l DO wear a white t-shirt l had brought with me. [l had seen guys wearing white t-shirts at other race meetings]. My main goals for the weekend was to not damage the bike....not damage myself.....whittle away my lap times and have a good time. My first races on Saturday were comical.. l had trouble shifting and getting used to the brakes [all of which were fine of course..]. My legs were too long for the pegs and l reckon my 100kg knocked 20hp off the bike. But holy crap wasn’t it fun! Sunday was a lot better....Fraser and l modified the shifter arrangement and added 30mm of foam to the seat and voila! l could change gears 100% easier! By Sunday afternoon l was lapping about 10secs faster than l was Saturday morning and that was OK to me. All in all it was a great weekend and l am now hooked. See all you guys again at the nationals in September!